It’s been a week since Jack’s surgery, and he’s doing very well! 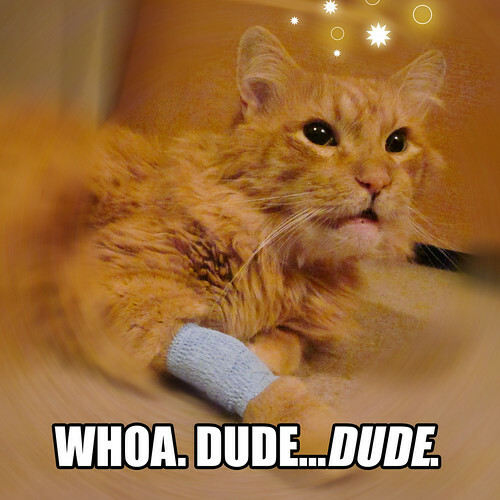 I gave him his last dose of pain medication on Sunday evening. He’s probably pretty happy I don’t have to pin him down and squirt medicine into his mouth. If it tastes anything like Robitussin, then I can totally feel his pain. Blech. The first few days he seemed kind of confused as to where his teeth went. I can’t blame him — if I went to sleep and woke up with 14 teeth missing, I’d be pretty confused, too. He seems used to it, now. I’ve been feeding him soft food, and I’ll continue to give him soft food until I get the go-ahead from the vet to try dry food again. He really, really loves soft food, so I may just continue giving him that (maybe in addition to dry food since I have quite a bit left from his most recent bag). I don’t think he’ll have any trouble eating dry food eventually because he was never much of a cruncher back when he had all of his teeth. I jokingly refer to his eating style as “cat vacuum.” He just inhaled his food. 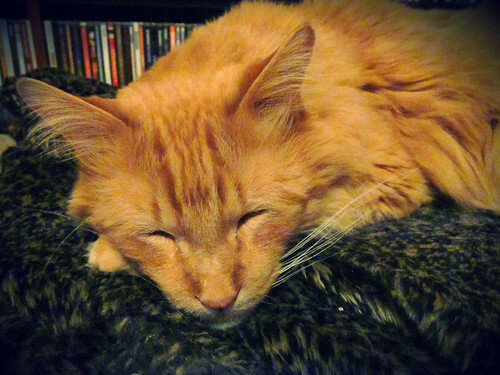 I got a call on Friday from the vet with the results of the biopsy they did on his chin. 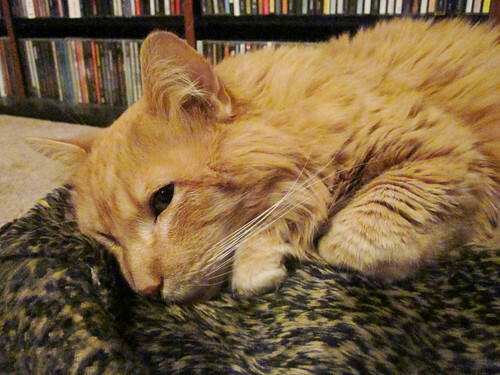 There’s no sign of cancer there, so either he just has a weird chin bone or it’s irritated from the Stomatitis. I’m just glad he’s in perfect health. His blood and urine tests came back normal as well. A huge THANK YOU goes to Lil Bub and her Dude, Mike. The world is a better place because you two are in it. Yesterday Jack had his dental surgery. I dropped him off at around 8:00 AM and was a nervous wreck all day. Not that I thought anything bad would happen, I just worried. You know, like “moms” do. He had x-rays taken, and 14 of his teeth were extracted in addition to the two that fell out on their own before he went in for the procedure. Many were abscessed. The remaining teeth were cleaned, and the vet said we’ll just monitor his remaining teeth over the next couple of years. 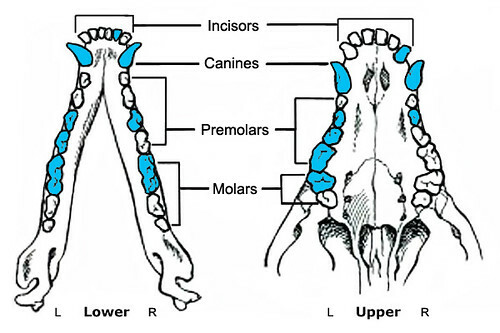 The above photo is a diagram of a typical cat’s teeth. The ones in blue indicate the teeth that were extracted from Jack’s mouth, or had fallen out before the procedure. He still has quite a few teeth left. 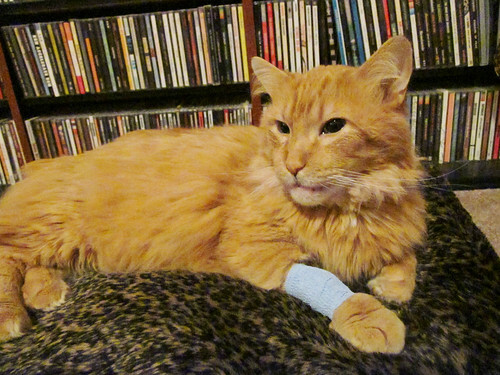 Jack had an injection of antibiotics, and was sent home with five days’ worth of pain medication (luckily, it’s liquid, so that makes it easier). He was really, really dopey when he got home. The first photo in this post is shortly after he got home. He had that dazed look on his face for a few hours. 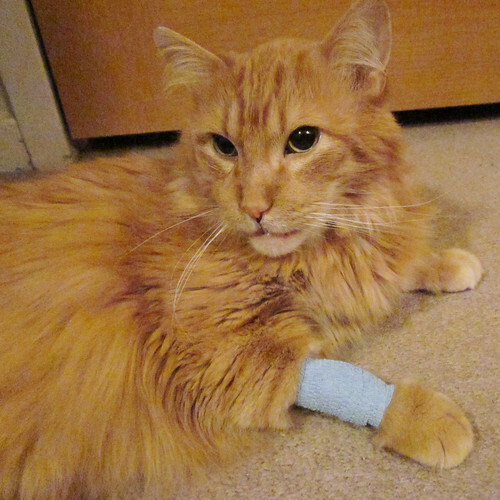 The blue bandage was to cover the injection site for his IVs. I thought it was really cute. He hated it, and kept trying to fling his leg around to try and get it off. I folded up a fuzzy blanket for him in my bedroom and let him rest up. He loves fuzzy blankets. This is Jack at about 9:30 PM last night. He was so sleepy. He was hungry at about 11:30 PM last night, so he had his first meal post-surgery. He needs to eat soft foods for a couple of weeks while his mouth heals, but he definitely doesn’t mind! He loves soft food. He ate normally today, too. They also took a urine sample yesterday, since they couldn’t get one from him a couple of weeks ago when they took a blood sample. Everything came back normal. 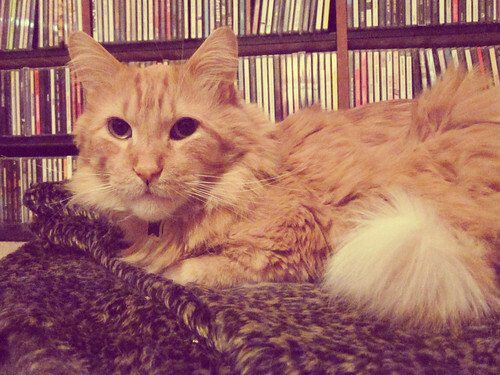 They took a biopsy of his chin because the bone is kind of abnormal, and the vet wanted to rule out any tumors or other issues. She thinks it’s related to the swelling and abscesses in his teeth, but I guess I’ll know for sure early next week when the test results come back. I’m relieved that the problem teeth are finally out of his mouth. I know they were annoying him, and I’m sure he was in pain but just didn’t show it (because he’s badass, apparently). Hopefully he’ll feel much better. Last Friday I took Jack to the vet because I noticed he had a loose tooth. He was licking at his mouth like he had something stuck in his teeth, so that’s when I looked in his mouth and saw that one of his incisors was practically hanging out of his gums. Other than the licking, he hadn’t shown any signs of pain or difficulty eating or grooming. The vet looked at his mouth and she said it looks like he has Feline Gingivitis Stomatitis. Basically, it’s a condition where the cat’s immune system “attacks” their teeth as if they’re foreign objects. Their gums get swollen and irritated, and their teeth will get a horrible buildup of plaque, and usually start falling out. Sometimes, this condition correlates with FIV, Feline Leukemia, or other underlying health issues. To be safe, the vet took a blood sample from him and had him tested for everything. He came up FIV and Feline Leukemia negative before I adopted him, but I definitely wanted to make sure he had a clean bill of health. The tests came back and the good news is that he’s healthy, other than the FGS. He has an appointment on January 29th. They’re going to take x-rays of his teeth to see just how badly the FGS has affected his teeth. The problem teeth are going to be extracted, and the remaining teeth will be cleaned. The only issue with leaving some teeth intact is that the FGS will usually attack those teeth eventually, so they’d have to be extracted later on. From what the vet has said and what I’ve read about FGS, the most effective plan of action is to just remove all of the cat’s teeth so that there’s nothing for the FGS to attack. Cats do pretty well without teeth, and since Jack doesn’t chew his food anyway, he probably won’t even know the difference. So, the vet bill is going to be pretty massive. The vet estimated $700 to $1,000. I’ve already spent $250 on his blood tests. I’m going to put any expenses on a credit card, but paying off that debt is going to be a little difficult. My family and friends suggested I start a fundraiser in case anyone wants to contribute. I did, and so far we’ve raised $70.00! It doesn’t sound like a lot, but it’s a lot to me. I’m not worried about the surgery — I’m sure it will go well, and Jack will recover quickly. I’ll do anything to keep my little furry buddy around longer.